Back in March of 2017, the university broke ground on the Health, Wellness and Athletic Complex (HWA), coined the “Steamer”. Since then, community members and students alike have watched as the space has evolved from dirt and gravel to the scaffolding and now roof of the facility coming to life. On Thursday, Senior Associate Athletic Director for Athletic Operations Bret Billhardt was willing to show us around. Starting in the Health, Physical Education, Recreation (HPER) Center, the locker rooms are going to be re-done. Men’s Basketball and Men’s Volleyball will be at one end of the locker room hallway while Women’s Basketball and Women’s Volleyball will be at the other end. Within the renovated locker rooms will be a “country club style locker room” for Golf as well as Track and Field, Billhardt explained. The most notable portion of the renovated locker rooms will be the “punch out” doors that will lead straight from the locker rooms to the Pam Evans-Smith Arena. The athletes will no longer have to take the back hallway and emerge on one end of the court. 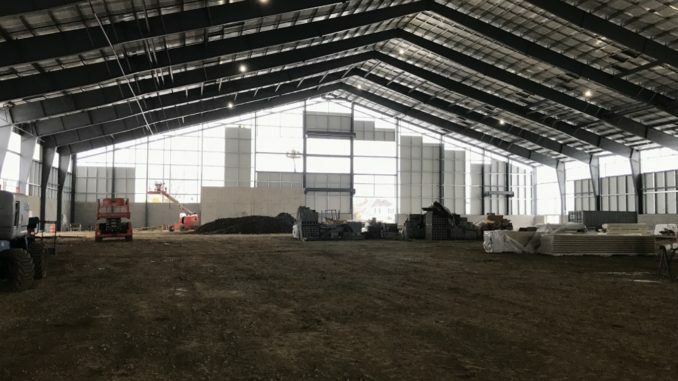 The storage area on the far side of the arena will be transformed into a locker room for officials and will be used for both arena and field sports. The current racquet ball courts are being combined and cleaned out to become the new Strength Center. The space will be filled with treadmills and has the potential to be used for exercise classes and possibly yoga. While walking outside, into the rain, Billhardt explained that the space between the new HWA and the HPERC will be the new weight room. “The weight room will be split into quadrants” Billhardt said. Explaining that it is split so that teams can come in and lift, while leaving room for recreational use for students, staff and community members. The weight room will be a portion of the new building, being coined the “Connector” for lack of a better name, which will allow for movement between the HPER and the HWA. The Connector will also contain the coaching offices for the arena sports. Heading under the Steamer’s roof, Billhardt walked through the layout of the building. The 120-yard field will consume the middle of the space, with the 300-meter track that runs around the exterior. At the far end, closest to Edwards-Maurer Field, there are four batting cages that drop down from the ceiling, allowing both softball and baseball teams to practice at the same time. Along the wall, there is a section that has three levels. Billhardt explained that the bottom level will be a concessions area with men’s and women’s bathrooms that will be accessible from Edwards-Maurer Field so that fans won’t have to walk up to the HPER lobby for those services. The second floor will be a viewing area filled with comfortable seating, while the third level will be the new press-box for the field. While the facility will not be fully open until the expected date of “October 25, of next year ,” the press box will be accessible and ready for use this fall. Around the track on the side of the building closest to the HPER, there are two long-jump pits that can be used for the field team to practice. At the far end of the facility, closest to the Tennis courts, the wall is in the process of being reinforced so that the lacrosse teams can practice throwing the ball against the wall and catching it. “We had to reinforce the wall because if you throw a ball against brick enough times, the brick will eventually crumble” Billhardt explained. The 1929 field house has been undergoing restoration for quite some time. The gym floor has been completely restored and polished, complete with a red flying W in the middle. The length of the court is the size of a college basketball court, but the width of the court is completed with two high school courts. “We wanted to make sure that we had the high school length courts,” in case high schools wanted to “use our facility” for summer camps, Billhardt said as he gestured to the spaghetti-like look of the floor. In March of 2019, Pam Evans-Smith arena will be taken “offline” and the men’s volleyball team will be completing their season in the 1929 facility so that the arena can be cleaned up and given a face-lift. In the coming months, the natatorium will be cleaned up as well as the pool being drained and painted. The old 1929 building has been completely renovated. Prior to the renovation, approximately 60 percent of the building was used while the other 40 percent sat untouched. With renovation 100 percent of the space will be used. There have been new bathrooms and shower stalls installed in the locker rooms, with brand new lockers that contain a safe for each athlete’s personal items that will be programmed with a code of their choice. The new bathrooms have moved away from the communal approach with independent shower stalls available for athletes. The Men’s soccer, lacrosse and football locker rooms are all connected by a corridor. However, to enter the locker room students will have to use the pass code that is programmed for the door. Both the women’s and men’s locker rooms are going to have these locks on their doors, so that only the athletes can enter those spaces. The old pool in the 1929 field house has been converted to the new training room, with offices for the athletic trainers, turf for rehabilitation and cubbies for students to store their items while in the room. The graduate assistants of the athletic trainers have an office that is encircled with a connected desk, creating a bull-pen like space. The old stage, that had its wooden paneling restored, has been converted into three Exercise Science classrooms. One of the most notable restorations to the 1929 facility are the old double doors on the side of the building that faces Hollenbeck, they will be fully operational when the building reopens. Now, there will be a “clear pathway from Hollenbeck to 1929,” Billhardt said. Other nuances from the old building that are being preserved includes the wooden display cases on the second floor, the wooden paneling in the offices and the brick throughout the building. The training room and locker rooms are located in the basement of the facility. 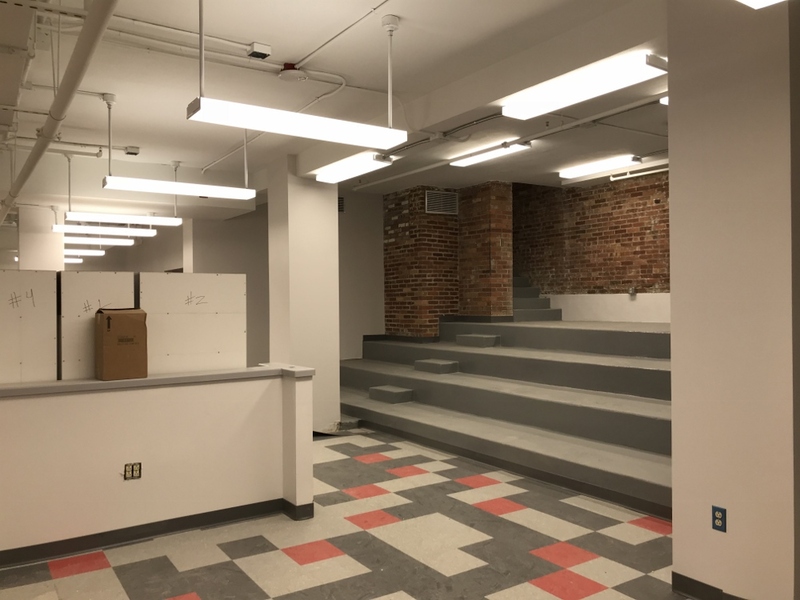 The offices for the Exercise Science professors that are currently located in Blair Hall, along with their classrooms, the football and spring sport offices and all of the offices for the athletic staff are sporadically placed throughout the first and second floors. There is a student lounge being completed in the 1929 field house that will be available to all students. The room is going to be filled with comfortable furniture and flat screens to create a study area. The lounge is also set up to hold approximately 130 people and can be used for all sorts of events, along with the conference areas, which will all be available for reservation on 25Live when the building opens. 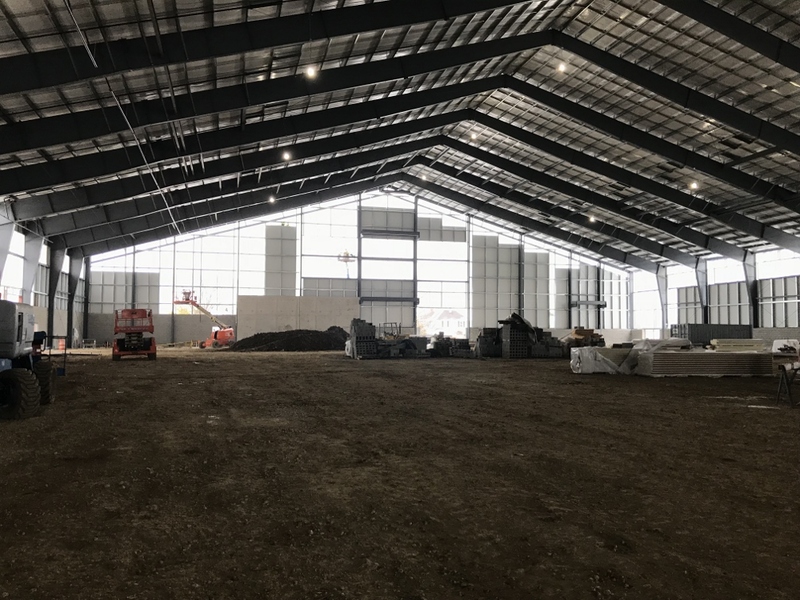 There has been no set date for the move into the new facility, but Billhardt is looking forward to having all of the coaches and staff back under one roof. For more updates on the HWA facility, check out wittenbergtigers.com for pictures and the webcam that is watching the progress every day. Facing the tennis courts, the exterior HWA construction is underway. The 1929 natatorium includes space for offices for athletic trainers.